Celebrate the blessings of family, life and faith with contemporary music from Chris Muglia. How Could I Want Anything More? 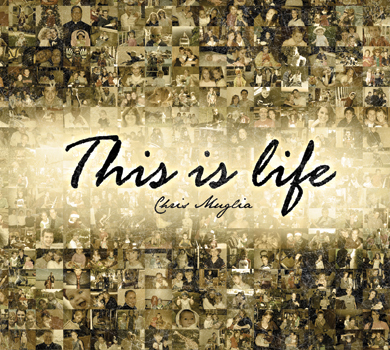 Building upon Fight the Fight, Change Your World and Innocence, Catholic singer/songwriter, recording artist and producer Chris Muglia delivers his powerful fourth release This Is Life-an album celebrating the blessings of family, life and faith. Inspired by the birth of his daughter Holly, Chris' latest album is a record for families. Chris reminds us that God can be found dwelling in the details: the day-to-day, how we deal with hardships, how we appreciate relationships. This is life, as the CD title so eloquently puts it. Chris teamed up with Scott Dente and Ken Lewis to produce a record that embodies the intensity of a live concert, with just the right touch of polish. The top-notch arrangements and instrumentation do a fabulous job of enriching, without overshadowing, the heartbeat of each song: Chris' lyrics. The title track captures the very essence of the album, recognizing that the most ordinary moments are often the most profound. "How Could I Want Anything More?" is a touching dedication to Chris' wife for her openness to life and for making their family possible. A stunning piano ballad, "I Need a Savior" finally fulfills one of Chris' longstanding wishes: a song featuring an orchestra of strings. From start to finish, This is Life demonstrates Chris' uncanny gift for crafting inspirational songs that connect with audiences around the world. Ringing true at the core of every chord struck and every word sung, can be found God's universal message that binds us all together... love. This is the MP3 playlist for This is Life. Building upon Fight the Fight, Change Your World and Innocence, Catholic singer/songwriter, recording artist and producer Chris Muglia delivers his powerful fourth release This is Life—an album celebrating the blessings of family, life and faith. The title track captures the very essence of the album, recognizing that the most ordinary moments are often the most profound. “How Could I Want Anything More?” is a touching dedication to Chris' wife for her openness to life and for making their family possible. A stunning piano ballad, “I Need a Savior” finally fulfills one of Chris' longstanding wishes: a song featuring an orchestra of strings. From start to finish, This is Life demonstrates Chris' uncanny gift for crafting inspirational songs that connect with audiences around the world. Ringing true at the core of every chord struck and every word sung, can be found God's universal message of love that binds us all together.